elos™ Diode Hair Reduction/Removal technology is the first technology that uses combined energies to effectively and gently remove hair of many colors and types from all skin tones. A combination of Bipolar Radiofrequency and laser energies target dense, concentrated pigment in the hair follicle where selective destruction of the hair follicle results in decreased hair growth. Both men and women can achieve permanent hair reduction on almost all body areas. While this technology has been shown to remove a variety of hair colors on all skin tones, successful outcomes treating lighter hair colors is more difficult and may require many more treatments compared to darker hair colors. FDA cleared for Hair Reduction/Removal Treatment. A virtually painless treatment resulting in no downtime — you can return to your daily activities immediately following treatment. The precise heating of the targeted treatment area, ensuring a safe and effective treatment. 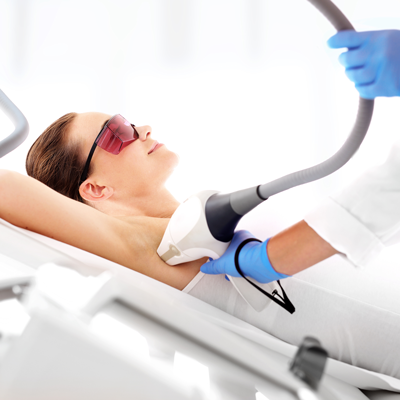 How are elos™ Diode Hair Reduction/Removal treatments performed? Beginning about 30 to 45 minutes before treatment, you will be instructed to use a topical anesthetic ointment on the treatment area. Just prior to the procedure, your skin will be cleansed, protective eyewear will be applied and cold ultrasound gel will be smoothed on the skin surface. Most patients describe a warm, light “rubber-band snap” sensation as the energy enters their skin. To minimize discomfort, cold air will be used on the treatment area during the procedure. The procedure takes anywhere from 5 to 60 minutes depending on the areas treated. Afterward, a calming cream and cold compresses may be applied, to help reduce any redness or swelling, which should be minimal. Most patients feel a little bit of warmth in the skin afterwards, which usually diminishes in 1 to 3 hours. How long does it take to see results and how long does it last? Hair growth is reduced after each treatment. The number of treatments required will be based on your hair color and type, body areas and skin tone. Initially, a minimum of 3 to 5 treatments spaced about 4 to 8 weeks apart is usually required for optimal results. Most patients see gradual and cumulative results throughout the treatment regime. Typically, maintenance treatments are recommended once or twice yearly after the initial set of treatments is completed. The cost of elos™ Diode Hair Reduction/Removal varies from person to person. Treatment price is based on factors such as number of and size of treatment areas and patient response to the treatment. Patients should always assume that there would be an initial series of treatments spaced about 4 to 8 weeks apart and then once or twice yearly maintenance. A personalized consultation will provide more specific details. For additional information, visit the Syneron website.